Aloha everyone! I'm so excited to start sharing my trip to Hawaii with all of you. It was one of those trips that I know that I'll remember for years because it was just so incredible. One big reason for that, and something that I was really looking forward to, was all of the amazing hiking! 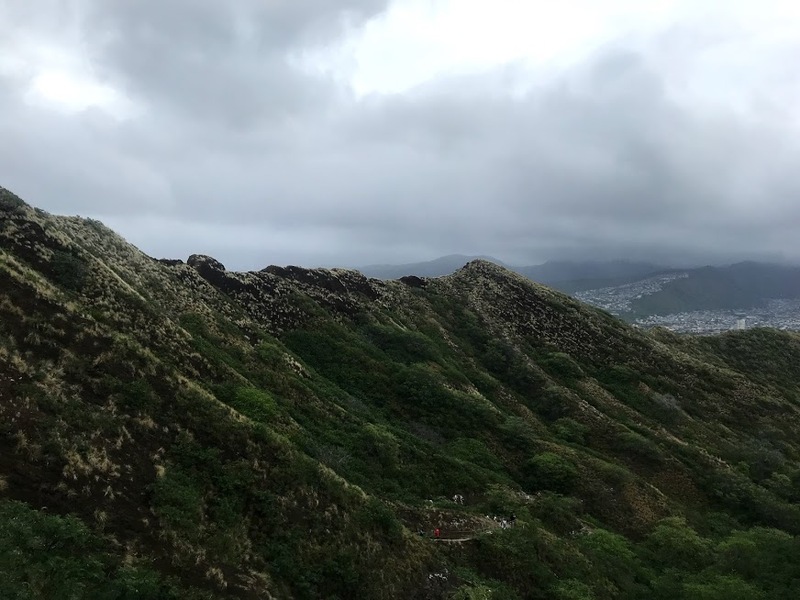 I've always seen pictures of hikes that people do while in O'ahu, and I knew I wanted to do as many as possible. When I started to plan out my days, I made a Google Doc and would write down every hike that someone mentioned or that I saw online. Then, I looked each one up on All Trails (one of my favorite apps) to see how challenging it was, how long it was, and the distance from my hotel. 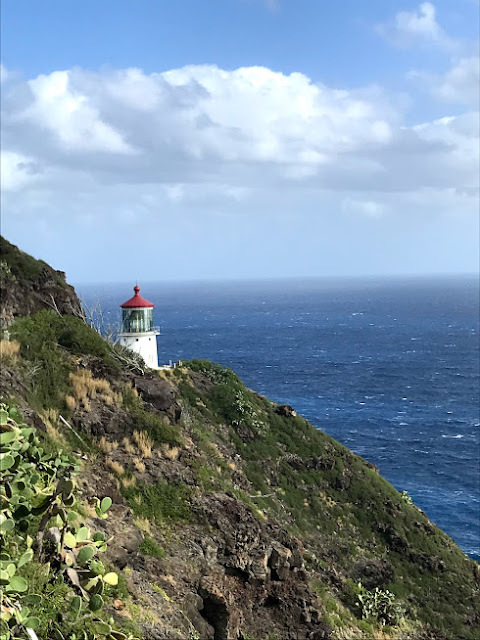 Since I was working during the trip, I knew that during the week I could only do shorter hikes that were close to the hotel, then on weekends I could do longer, more challenging ones. Taking my list, I prioritized each one and just went down the list until I finished. In the end, I did a hike almost every day! Some of these were easy, short ones, and others were more challenging and took the better part of a day. Today I'm going to be sharing my top six hikes that I went on in O'ahu. I'll be talking about them in order of difficulty, share some info about length and any opening hours or cost, and my opinion about each of them. I didn't want this post to be TOO huge, so I limited myself to sharing only two pictures per hike, so if you're interested in more info or seeing more pics, let me know and I will happily send them over. Let's get to the hikes! This was definitely the easiest, but also the hottest, hike that I went on. The trail is easy to find, with a large parking lot at the trailhead. I went on a weekend around 10AM and it was already very crowded, with walkers, runners, bikers, strollers, and dog walkers. The trail itself is completely paved and is one long hill to to the top look-out. There is one switchback at about the halfway point, and a few spots along the way to stop and rest. I also found a little dirt path that takes you right by the light house! 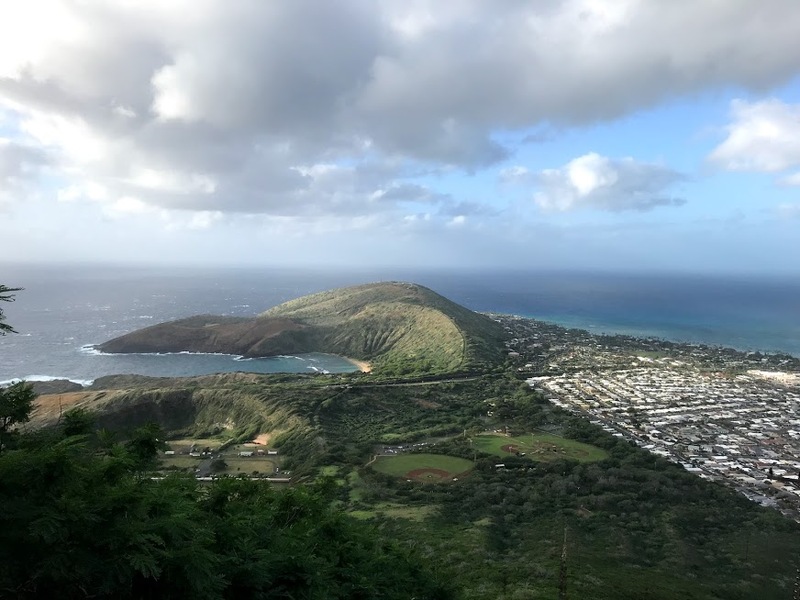 At the trailhead, there is also a smaller dirt trail called Kaiwi Shoreline Trail that is shorter and flatter, that takes you down to the water. 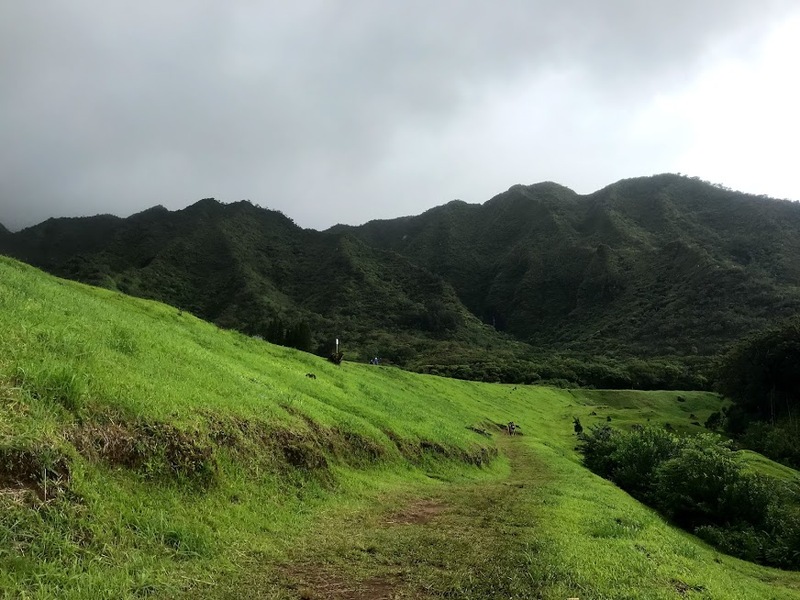 On most websites and blogs, this trail is listed as the most beautiful in O'ahu. It's easy to see why- on your way to the main attraction (a huge waterfall), there are endless photo opportunities. 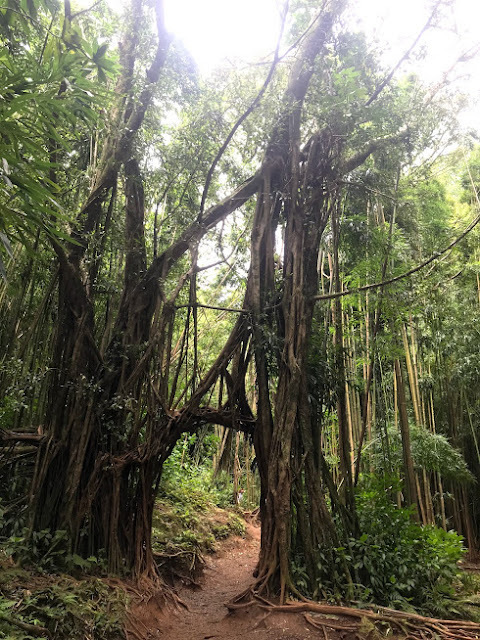 You walk through trees that have formed into arches, bamboo forests, natural steps, and are surrounded by towering mountains. This also meant that the trail was really crowded, and I saw tons of people during my hike. The trail is in the rain forest, which means that it's shaded and cool, but also muddy and buggy. There were a few places that I slipped a bit (particularly when you get close to the falls), but otherwise this is an easy hike without any huge hills to climb. Near the waterfall, the trail connects to the Aihualama Trail which takes you to the Nu'uanu Lookout if you're looking for a longer and more challenging hike! Right beside the Manoa Falls Trail is Lyon Arboretum. With a suggested $5 donation, you are given a map and are able to explore the property. 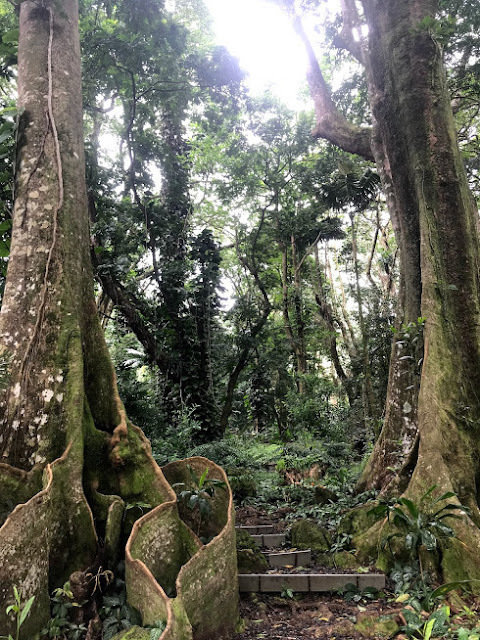 There are a number of well-marked trails that take you through different types of plants and trees from all over the world. 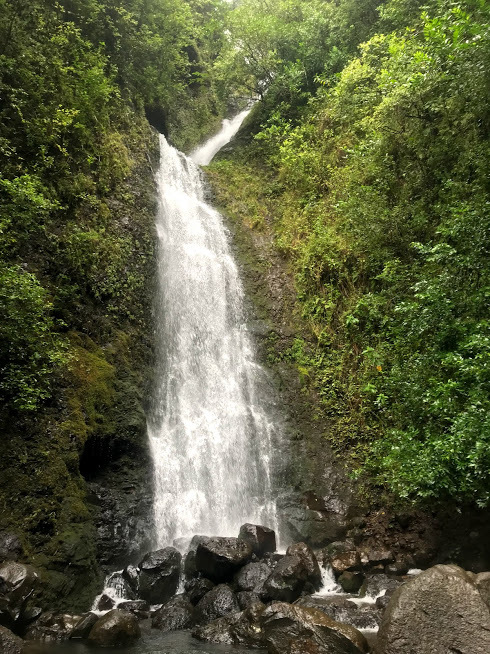 Or, you can stay on the main, cobblestone path that takes you directly to 'Aihualama Falls. 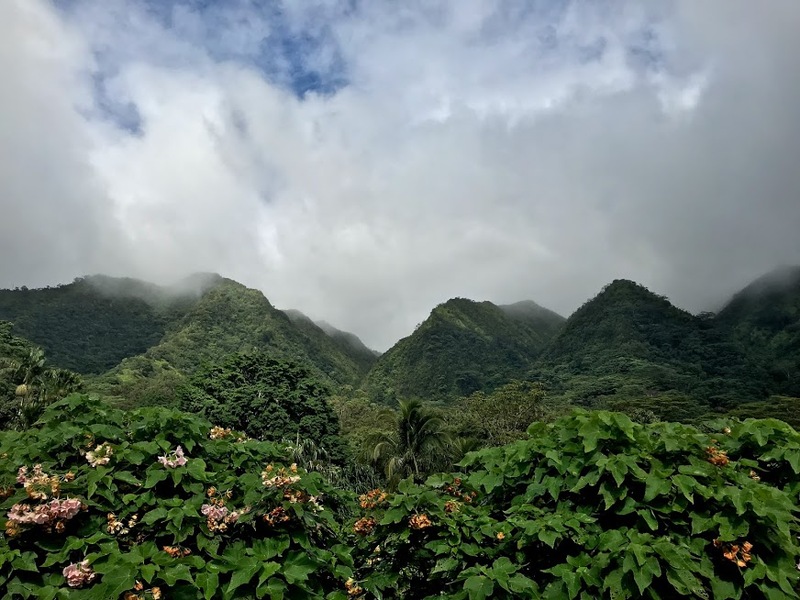 Even though this was directly beside the very popular Manoa Falls trail, there was hardly anyone at this park! It was really beautiful and peaceful, and I only saw two other hikers on my trip. It was very serene, and I even had a little picnic at the base of the waterfall. As another very popular and well-marketed hike in O'ahu, I knew that this trail would be really busy, and I was right. There was construction going on during the week, so my first opportunity to enter the monument came on a weekend. Even though it was an overcast and rainy day, the trail was absolutely PACKED! 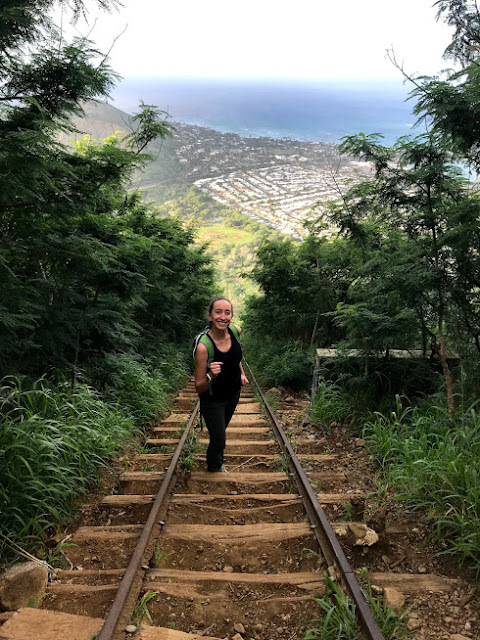 This trail is definitely more challenging than the others, with lots of hilly sections, and really steep steps once you get close to the summit. 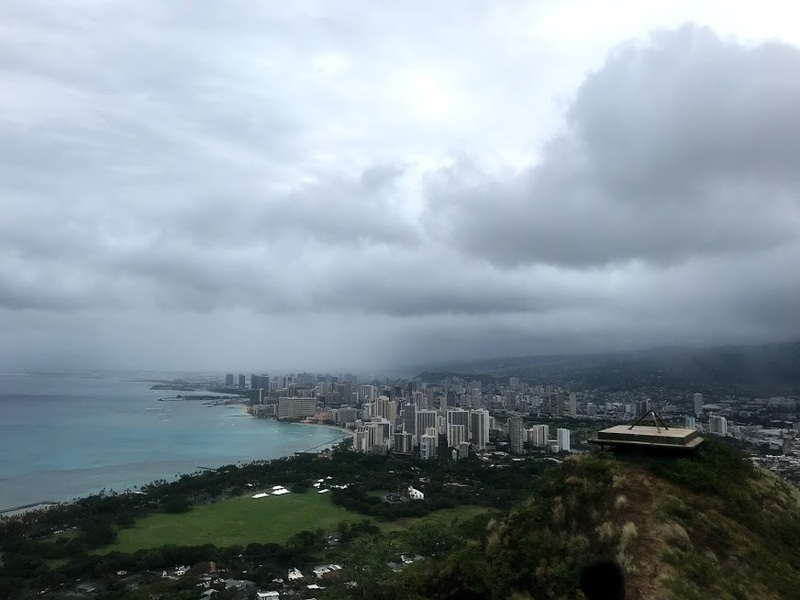 There are amazing views of Honolulu and the ocean. It was really beautiful at the top and made the tough trek worth it! There were even lots of runners on this trail if you're looking for more of a challenge. This was one of the more exciting and fun hikes that I've ever been on. It starts out easy enough with a beautiful trail out in the open that takes you to the forest. I couldn't stop taking pictures of all of the green rolling hills and mountains that surrounded us! As soon as we entered the forest, things got more challenging- starting with crossing through a small waterfall. From there, the trail was kind of challenging to follow. Luckily, there were small pink ribbons tied to trees that helped mark the trail. This included many more crossings over the creek, a few scrambles up rocky hills, and even using a rope to rappel down a (tiny) cliff! At the end of the hike, you'll find a beautiful waterfall. I was told that when it's really rainy and windy, the falls actually go backwards. Even though it was both windy and rainy, we unfortunately did not notice any upside down falls! Even though this was one of the shorter hikes that I went on, it was easily the most challenging! Starting off near a baseball field, you walk on a trail for a short bit, then go up and up and up! The trail is actually old railroad ties that would take supplies up and down the mountain, where a lookout bunker sat at the top during World War 2. In fact, at the top you can still see remnants of these bunkers. The most challenging part of this hike is that the closer to the top you are, the more steep the steps get. I was with a group, and we stopped more and more the closer we got! I would definitely recommend taking water, because we all definitely needed it and our quads were toast by the time we reached the summit. At the top, the views absolutely make this hike worth it. You can see just about everything all over the island, and I've heard that this is a beautiful place to watch the sunrise or sunset. Just be careful- it was VERY windy at the top, and I was afraid to get too close to the edge (which is probably why my pictures turned out blurry). Luckily, the trail is blocked from the wind, so I never felt in danger while I was going up or down. Just watch your footing and take your time! What is your favorite hike that you've ever been on? I loved hiking in Hawaii. 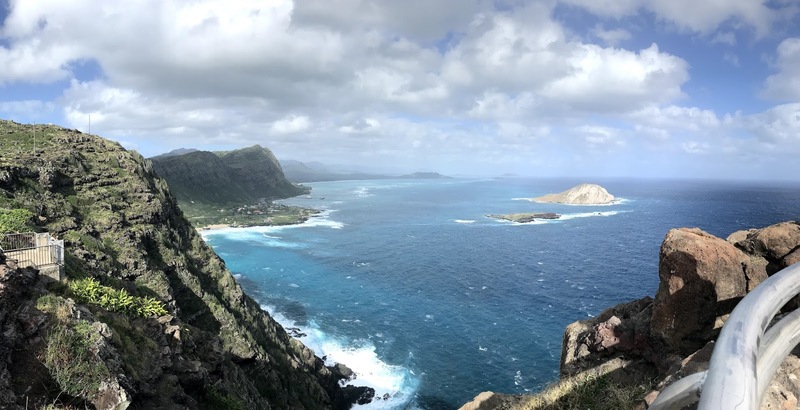 We did the coast line trails (up and down the un-paveable areas) of Kauai and it was everything. Hawaii is number one on my must travel list! I'm hoping to go in the next 5-10 years. Looks beautiful! Top Five Friday : Happy Holidays!